Like every other 6 months now, I pay a visit to the Salon du Vintage (check here my previous posts). 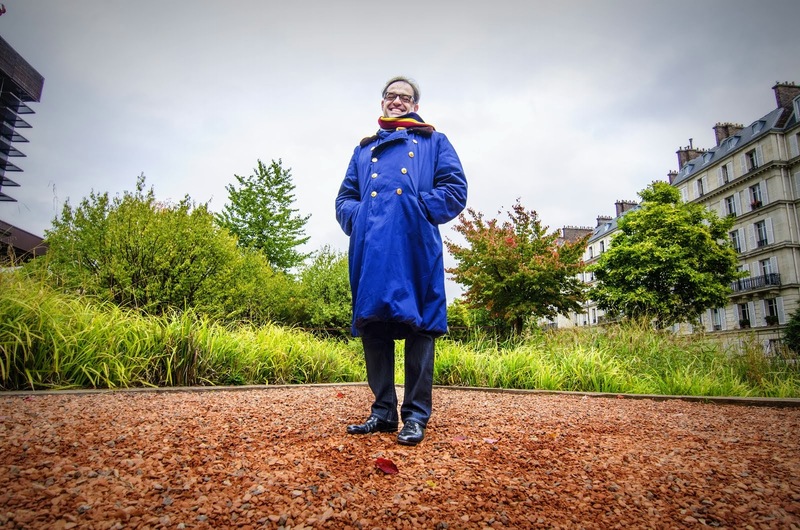 Last night I went to the opening of the current session which will last until Sunday in the Marais (and more precisely in an old gold factory located at rue des Francs Bourgeois). Like always they have vintage clothes, shoes and jewels, but they also have old industrial and commercial furniture like the one in this photo. 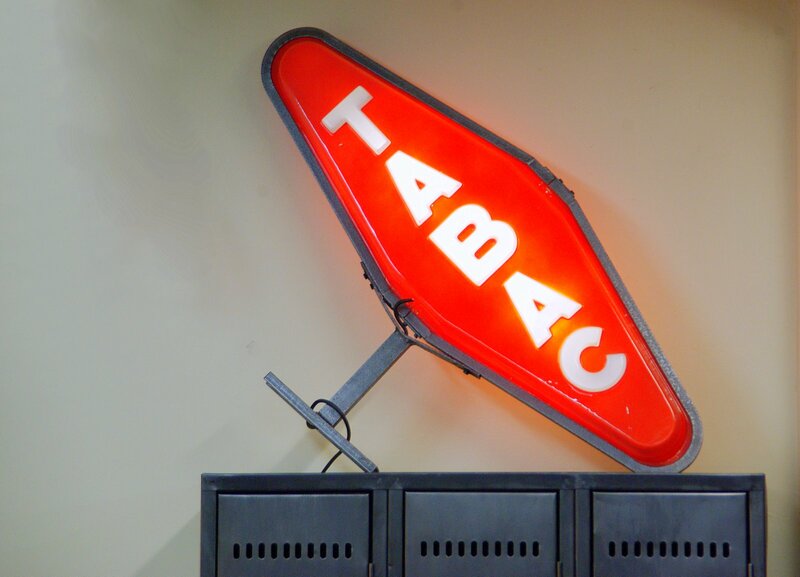 This old Tabac sign is actually double vintage: 1st because it's an old classic and 2nd because smoking is also outdated! Never thought I'd see the day when smoking left France, or almost. I still like these signs, though. What Bibi said! Seriously, is nothing sacred? Love the photo and would love to have the (doubly) vintage sign too. Somehow, you made this sign look modern and new! Now that I think about it, I don't see those plastic signs anymore, one attached to the other ,vertically, that would advertize all the icecream flavors or some entrees in a bistro , like omlettes etc. I would love one of those. i bet it will come back some day because everything becomes "retro" sooner or later. i am talking about the sign of course. as for smoking, i must say that i still have a ciggy on occasion...please don't hate me. Such Beautiful Typeography....Been following yur site since 06. 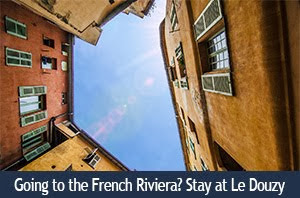 I just wanted to leave you a comment finally to tell you I've been enjoying your blog. I look forward to seeing it my RSS reader every evening! I found out about it from JM, who I work with at EnglishCentral. You made a lovely grapic of it Eric! The red gray and white look wonderful. Hope you enjoyed a lot of other things in the Salon du Vintage. These seem of an era where cellophane covered paper packs crinkled when people opened them with those little red strips and where children blew out their parents matches. We know now how unhealthy the habit is, but there was an era in the 20th century where it was nearly as common as eating and filmmakers made light and smoke look artistic :-). Smoke and mirrors, eh? I hope these signs will never be outdated. «Louis» knows exactly where this place is! Nice bright colors and sharp lines. I like it! But I, for one, am glad about the smoking ban. I look forward to the day that it happens here in my state--only 20 more days to go!! It is nice to be able to go places without my eyes watering and stinging and getting all stuffed up because of the smoke. It will be sooo nice! 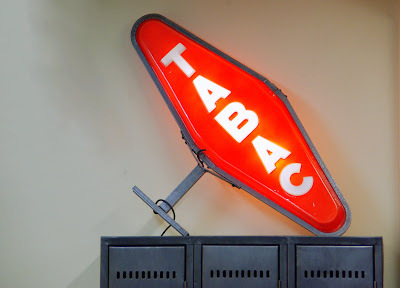 For a vintage item, this sign is in excellent condition & a true collectible too in that I am sure some smokers and ex-smokers find it very nostalgic. I've decided that I'll move to Paris sometime within the next 10 years.. But this is still used right? Not totally outdated, yey, even though I hope smoking is or soon will be even in France :)!